We offer a range of Modular Displays that consist of an aluminium frame system and is available in two styles - Fusion Rapid and Fusion Versa – and various combinations. Rapid is used with rigid graphics and Versa can be used with magnetically attached flexible graphics or rigid graphics, and is available in both straight and curved configurations. Please phone 0800 999 KWIK and ask for further details to be emailed to you. 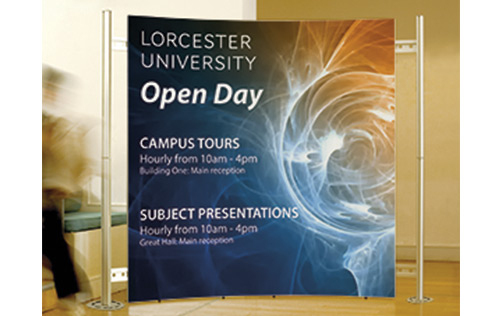 FAST – We would expect to produce your Modular Displays within 1 – 2 days. LOCAL – If you would like us to discuss your requirement we can visit your office – and at short notice. Free local delivery is part of our service - or you can collect from our centre in Clarence Street. We have a car park for customers’ use behind the centre.